One day, Francesco Cirillo, a university student in Rome, was sitting in his apartment kitchen. He looked across the table and noticed his tomato-shaped timer. Being Italian, he used the Italian word in his mind: “pomodoro.” He decided that, in order to get himself out of his work slump, he would challenge himself to work solidly for 10 minutes, using his pomodoro timer. To make a long story short, this technique worked. And he named it the Pomodoro Technique®. Loyal readers of my newsletter might notice that using a timer is the technique that we have advised people to use for years, based on research by Robert Boice and others. Except we don’t suggest tomatoes. Not that we’re against them – far from it. As a matter of fact, I just mailed tomato timers to each of the professors in my Professor Writing Group. I did this because one of them had gotten hooked on the Pomodoro Technique®. My article, Academic Writing: Use a Timer to Make Yourself Write (September, 2006) is an example of one of the articles I wrote about timer tricks. Use a timer. When you turn it on, you know that you can’t do anything else but write. No email, no Internet, no phone. The upside is that you know that when the timer goes off, you can stop writing, and do more enjoyable activities. Try setting the timer for short periods of time and then taking a break; say 30 minutes on and 10 minutes off. You can use the timer to time your breaks, also. The Pomodoro Technique® advocates 25-minute work sessions, followed by a 3-5 minute break. The 25-minute session is called a “Pomodoro.” Every four Pomodoros brings a 15-20 minute break. Cirillo also recommends keeping records of the number of Pomodoros completed each day, so that you can track your productivity. He believes that record keeping is a key part of his system. The technique goes on to describe methods for estimating the number of Pomodoros a given task will take, as well as ways to improve those estimates over time. By estimating your time-spent before hand, and gradually honing in on more accurate predictions, you begin to see the rewards of uninterrupted productivity. One idea that I liked is his record-keeping system for dealing with distractions and interruptions, both internal and external. Once you are trained in how to deal with an interruption, you are able to make better progress. In his system, you make a mark to indicate that the Pomodoro was disrupted, and add the new task to a list of to-do items (or the “unplanned & urgent” listed recommended in the handbook), with better work flow. I totally agree with Cirillo’s emphasis on using a timer, short working sessions, taking a break, and tracking your progress. There is more to his system, which I’m sure you’ll find useful, whether as a review or new information. He offers a free download of his book and other materials, on the Pomodoro Technique®‘s website. Especially keen readers will be yelling at their computers, “But that’s what the Academic Writing Club is all about! So true. There are some differences. For example, we do not insist on 25 minutes sessions, because some people are more blocked and must start with smaller sessions, even 5 or 10 minutes. Others like to write up to 45 minutes. We do insist that they take breaks. The Writing Club has a place to track your progress, including number of minutes spent writing, along with automatic graphing of your progress. As you know, there is much more to the Club, but Cirillo’s technique is in sync with the basic tenets of our Writing Club. So if you have tried using the tomato-timer technique and need a little more support, motivation and guidance, consider joining the Club. 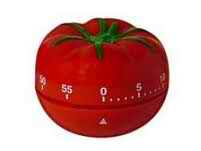 I think the tomato timers are adorable, kind of like a little friend that reminds you that you must stick to your task. All in all, I think Cirillo’s presentation of this technique is delightful and fun. I love anything that underscores the messages that actually help academics succeed! Join the Academic Writing Club. It will give you the ongoing encouragement, gentle nudges, and a group of supportive colleagues to help you get clear that You are the experiment, and your behavior is the data. Joining the writing club will help you get real about your work and get on with it. Next post: Dissertation Writing: Make Good Use of Your Free Time!